Pompano Beach is a city in Broward County, originally incorporated on July 3, 1908. Its name is derived from the Pompano Fish. Pompano Beach experienced significant growth during the Florida land boom of the 1920s and again following World War II. In 1947 the City of Pompano merged with the newly formed municipality on the beach and became the City of Pompano Beach. Pompano Beach has been listed as one of the top real estate markets, being featured in CNN, Money and the Wall Street Journal as one of the country's top vacation home markets. Pompano Beach Airpark, located within the city, is the home of the Goodyear Blimp Spirit of Innovation. Pompano Beach Moving Company Supreme Relocation are fully insured and provide a host of services that will take care of everything you need to make your moving experience smooth and stress free. We specialize in local moves in addition to providing moving services to anywhere in the USA. Supreme Relocation is an Accredited Business with the Better Business Bureau and a founding member of the Palm Beach County MVP Program. We are proud to have established a reputation for quality and reliability. Whether your move is local and long distance, we look forward to taking care of your family and your belongings. We’re nice guys and you’ll like the way we move! Call Jamie or Steve today for a free estimate. 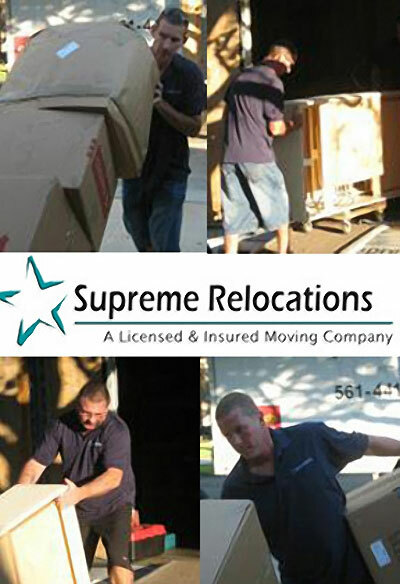 Supreme Relocation proudly provides local and long distance moving services, commercial and residential to Palm Beach and Broward County including the cities of West Palm Beach, Wellington, Lake Worth, Boynton Beach, Delray Beach, Boca Raton, Coral Springs, and Pompano Beach.